I felt uncomfortable with the interview Oprah did with Michael's kids. Michael's mother was silly to allow it. Michael Jackson never wanted the media intruding into his children's life. Oprah took advantage of those kids. Someone as Oprah should have known that it was not right for her to do that interview. She could never had tried such if Michael was around. What Oprah did was 100% wrong and I hope she gets sued someday, soon. AMAZING......NO ONE WAS TAKEN ADVANTAGE OF DUMMIES.....THE MOST DIGNIFIED INTERVIEW EVER.....LOVES THEM AND GOD BLESS THE CHILDREN. im a hug mj fan from iran.do any one know how could it Download the complate version of this video?? 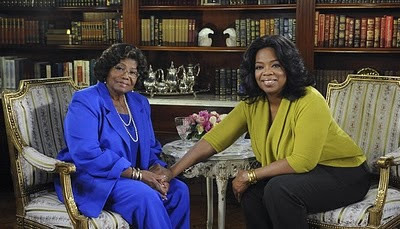 I think Katherine allowed Oprah to interview the kids so the world would know the type of person he was as a father. Its not like the whole interview was centred around them, I agree that MJ wouldn't have liked it, but they are MJ's children there would always be media interest in them. Its a good thing MJ's kids are being raised with their cousins but I have to ask where are their parents? His kids seem so normal, kudos to Katherine. I just hope they don't go off the rails. All in all good interview, I felt Katherine's pain, even though somehow I think she was one of his enablers, she only confronted him ONCE?! MJ was addicted to prescription drugs long before Dr Murray came along...the Dr took advantage of the situation, its very sad but MJ was used by most of the people around him. @Teaser and @Anonymous: Can you allow these children to live a normal life? For the record, all what Jackson did like wearing mask on the children etc were very wrong and against the children's wish. Since they lived with their grandmother, they play with other children, do all the things any child wants to do and are very happy. Oprah did nothing wrong at all. Jackson is dead. Let the children start and live their lives on a fresh page. Very true guys,his mum should have known better..
it doesnt matter guys.Micheal is dead and he doesnt feel a thing if they show his kids face or not.the questn is,if they dont show it now when will they?or for how long will they remain masked? In my opinion, Michael is dead and the mystery behind those kids wont be as huge like when he was alive.Plus the fact that he is dead would cause the media to give less priority to the kids. Like Bisola said, I think his mom wanted to show the world what a good father, son, companion etc etc he was to his kids and people who loved him. On the contrary though, I think Oprah is kinda vulnerable for taking advantage of the family in order to increase her ratings and legacies(via relevant interviews). Oprah did not like Michael. She try to act like it's bcos of Michael changing himself is her problem. Oprah is a total mess and a manipulator. Hey, she's a journalist too so she will take any opportunity that comes her way. On the other hand, I am happy that the interview was done. To see that Michael is a normal person. His children love and adore him especially Paris(his little princess). I like the fact that Katherine kept it real about Michael. She disapprove of his surgeries but he had low self esteem which is a disease. I love Michael and I want people to know including Oprah that he is a great person and a great father and even husband. His children are so well raised. Jermaine is a mess for naming his children those names. He just wish he has what Michael has. I can only trust Katherine when it comes to Michael, don't trust the others including Janet.